Trucks carrying too much cargo have become a problem near Ha Noi. They are damaging a road and making the air dirty. Such trucks are not supposed to be on that road. However, nobody seems to be checking on whether heavy trucks travel there. 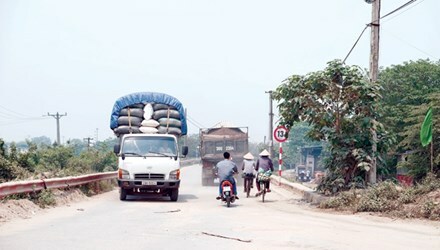 HA NOI (VNS) — People living near the dyke system in Ha Noi's Bac Tu Liem District have been complaining about overloaded trucks severely damaging the dyke road and polluting the environment. Meanwhile, the local authorised agency admitted lax control over overloaded trucks, blaming it on shortage of human resources and regulations. Nguyen Thanh Phuong, a resident of Thuong Cat Ward, said the 8.6km-long dyke road was the main road for trucks carrying sand from the River Hong (Red). Although signs banning trucks that can carry more than 13 tonnes have been installed, trucks with the capacity of carrying up to 25 tonnes of sand and cement have been seen using the road regularly. "They (overloaded trucks) have damaged the road. Sand from the trucks flies and covers households located near the road," Phuong said. A part of the road passing through Thuong Cat Ward has been seriously damaged by cracks and subsidence. There are 20cm-wide potholes on the road passing through Thuy Phuong Ward. Local residents have filled these potholes with soil and broken bricks to make the roads safe for people. Nguyen Hung Cuong, head of the Residential Area No2 in Tan Phong Ward, said he covered his two-storey house with canvas to prevent dust, but it didn't help much. "Dust covers my house, though we try to clean it three times a day," he said. Huong, another resident in the ward's Tan Phong Street, said three of her five-member family suffered from coughing as the air was very polluted. Dinh Quoc Dat, senior official of the dyke management unit No 1, said trucks carrying sand from the river gathered at a place before transporting their cargo to construction sites in Bac Tu Liem District. The unit had reported the case to the authority, and issued warnings to these vehicles too. However, it was not effective as the unit was not authorised to fine the overloaded trucks. Shortage of staff also made it difficult to resolve the issue, Dat said, adding there were only six members in the unit. Nguyen Thanh Son, head of Bac Tu Liem District's Traffic Investigation Unit, said overloaded trucks usually operated at midday or midnight to avoid detection by the traffic police. People living near the dyke system in Ha Noi's Bac Tu Liem District have been complaining about overloaded trucks severely damaging the dyke road and polluting the environment. A dyke is a wall that is built to keep water out of an area. Lax control means weak control. Human resources means people able to do a certain job. Although signs banning trucks that can carry more than 13 tonnes have been installed, trucks with the capacity of carrying up to 25 tonnes of sand and cement have been seen using the road regularly. To ban trucks means to not allow them. Households located near the road are houses that are situated near the road. A part of the road passing through Thuong Cat Ward has been seriously damaged by cracks and subsidence. Subsidence means land slowly sinking and collapsing. To resolve an issue means to find an answer to a problem. He said the unit would put more police personnel on duty at midday and midnight to crack down on overloaded trucks on this road. 1. A word that describes a truck carrying too much cargo. 2. A hole in a road that is a problem to traffic. 3. Something that covers Nguyen Hung Cuong's house, meaning that it must be cleaned three times a day. 4. A word that describes air when it becomes dirty. 5. Another name for the River Hong. 1. overloaded. 2. pothole; 3. dust; 4. pollution; 5. Red.